Hardocp got their hands on one of the first 6990’s for testing. They’re not allowed to say much about the card itself due to limitations given to them by AMD but going by some of the photos they posted I’ve managed to use photoshop and the ruler tool to figure out about how long the card is going to be. So if you’re waiting on the new 6990 and aren’t sure if it’s going to fit in your case or not – it appears to be 13.5 inches long. 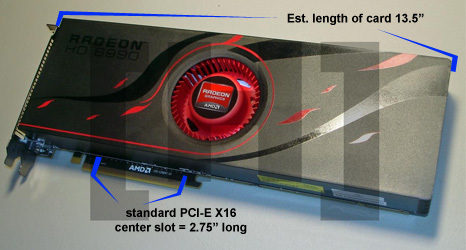 It will obviously take up two PCI slots and is the standard width for cards. It also has two 8-pin connectors for power and measures around 13.5″ long (just going by the one photo). In comparison, a 9800 GX2 is 10.5″ long and the AMD Radeon 6970 is just shy of 11″ making this new card one behemoth of a card!